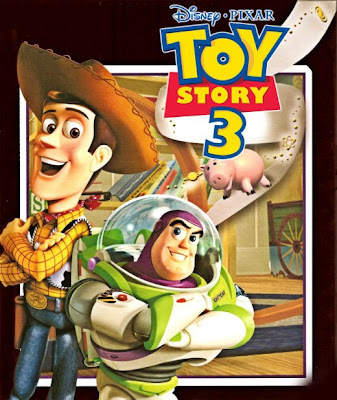 I have been seeing many people giving very good reviews for Toy Story 3 movie on Facebook. One friend in Facebook said she liked the movie and left a smiley remark about it. Another comment I saw mentioned that the movie made her shed her tears. All this while, I have been keeping this skepticism about Toy Story. I thought the movie was no good. Not fun. No cute characters. There are no beautiful princesses or charming princes involved in this animation. And they are just about these walking and talking toys - how fantastic can they be? Hence, I never watched and was never interested in its first and second runs. However, all this mind set of mine towards Toy Story was recently changed. Due to these GOOD comments about its third sequel that I read, I was so compelled to catch this although I didn't watch the earlier ones. I am a Disney die-hard cartoon FANATIC and luckily, my fiance shares the same sentiments towards cartoons as well. Hence, last Friday I made him take me to the cinema and catch Toy Story. Surprisingly, the JUSCO cinema has 3D Toy Story. I was excited and kind of motivated to test the good reviews about this movie - Whether it was actually as good as they commented. I found the movie itself as quite good, entertaining and surprisingly, although princess-less, I still like the plot and the characters. However, our movie date was definitely ruined by this particular person sitting right behind me. OK... Now the Toy Story topic is switched to this chap we encountered at the cinema last Friday night. I was quite angry about this and could not resist not to blog about him. This Malay chap was making such a big noise since the second the movie started. He was literally laughing and laughing very loudly for almost every second since the movie began until it concluded. He was laughing and making comments on not even funny scenes. When there were actually funny scenes, he broke even loudlier laughter like thunder. In short, he was just super and pure annoying to us. Until now, I still can feel his "hahaha", "HAHAHAHAHA", "wahahahaha", "hihihi" very deafening to my ears. Plus, his laughter was louder than the movie volume itself. Amazing! He was just a one selfish and intolerant lad that is not supposed to be admitted to any cinema ever! Because of him, I could not enjoy the movie to the max and was actually boiling hot until the point that I personally wanted to stand up, turn to him and scold him (three times) to mind other audience with his not cool laughing style. But then again, I thought of not making Toy Story 4 too early at that cinema plus I was just an audience in a foreign land. My fiance offered me to change seats to the front seat to stay away from him but the cinema was quite occupied. He even wanted to reply his laughter by laughing like him during the movie to make him realize how annoying he was, but in the end, he didn't do it either. After the movie was over, both of us burst into frustrations about this man. In the car on our way home, we talked about it for so long and shared long stories on the disturbances that we both experienced before at cinemas. At cinemas, we'd be sharing the movie with hundreds of people and likely, some of them might have funny characters. Those old generations who never set foot to cinema before and basically make comments about how fantastic a cinema is i.e. how loud the sound system is, how big the screen is, how clear the quality of the movie is, how big the size of the cinema is, etc. Anyway, these are just some random rants over my recent bad experiences at cinema. However, this will definitely not going to stop me from catching movies at cinemas or start watching DVDs at home just because of crazy people out there. I love and appreciate good movies. And I do love catching them at the cinemas, especially when boredom kicks in. Oh, Man! She's So Big Now!